Have you ever found yourself setting fitness goals over and over again but never actually achieving them? Youkeep promising yourself that this time will be different. You have the best of intentions but sometimes life just seems to get in the way. 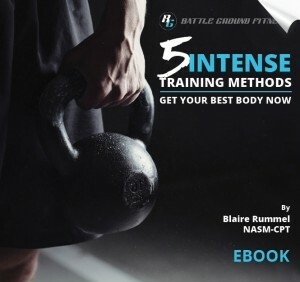 Written by renowned certified personal trainer and fitness expert, Blaire Rummel, this free ebook will help you understand how to make your intentions become a reality. In this ebook, you’ll learn how to make the most of your workouts and gain the maximum results. Are you constantly limited on time due to a busy schedule? Find out how to build more muscle and blast away more fat in nearly the same amount of time you are currently spending at the gym. The key is developing a multi-tasking workout routine. If you find these training methods too intense, remember to workout at your own pace. You can gradually increase the intensity of the workouts as you build up your strength and endurance. Blaire also explains the benefits of functional training for increased strength, better mobility, and more energy to perform everyday physical tasks. This ebook is loaded with instructions on exercise routines, images showing how to perform the exercises, and an explanation of how and why these exercises will result in you getting your best body NOW!